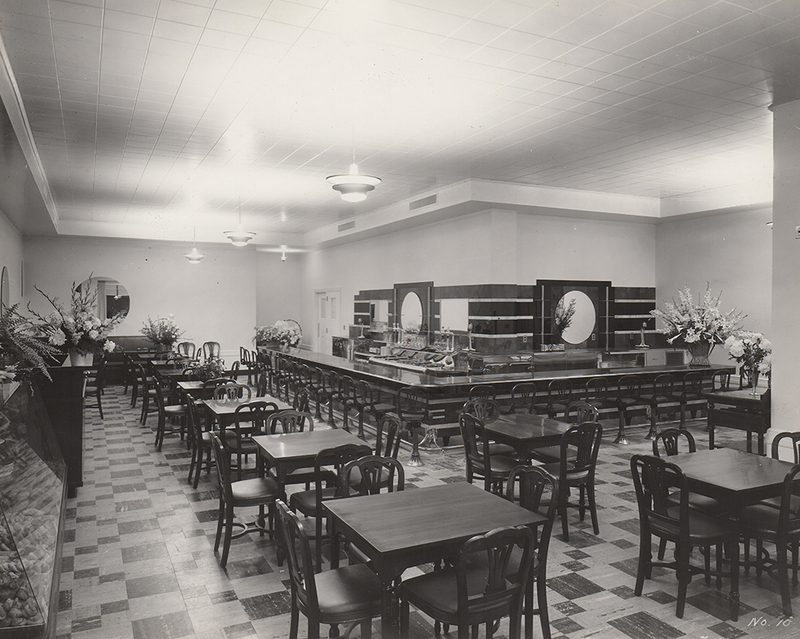 The photos below are from the second location of Smith’s Cafeteria in The Bell Building at the corner of Madison and Erie in Downtown Toledo. 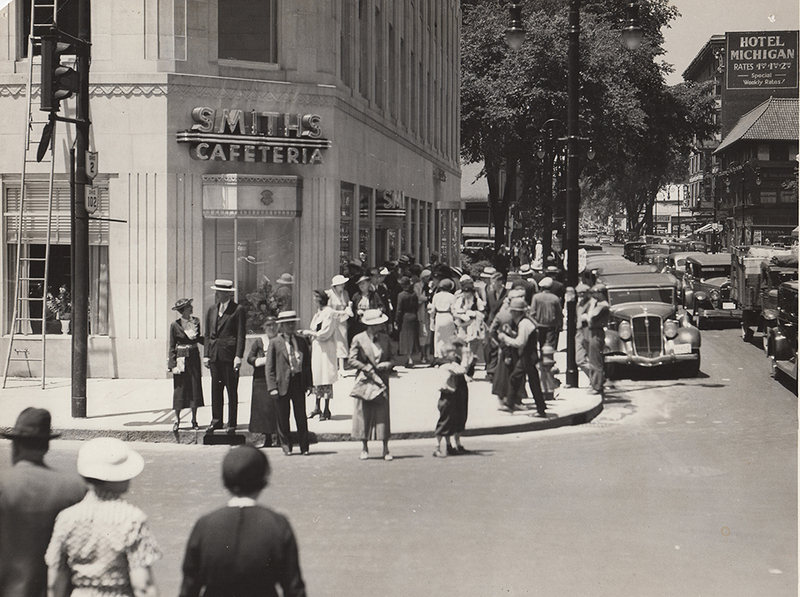 These photos were taken on and shortly after the opening in 1930. 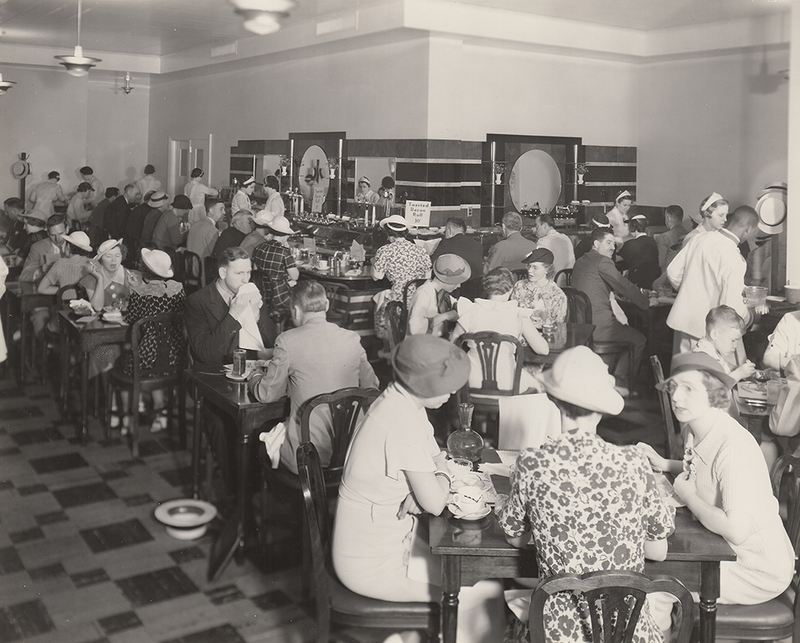 After Grace’s death in 1955, the cafeteria was run by family members until 1965 when it was sold to ABC Gladieux, which closed it in 1971. The commentary under these photos was hand written on the back of the photos. 1 A small part of the crowd opening day. The building is completed now – all windows in the entire building have venetian blinds. Grace has 5 offices on the second floor. The entire building is air conditioned. 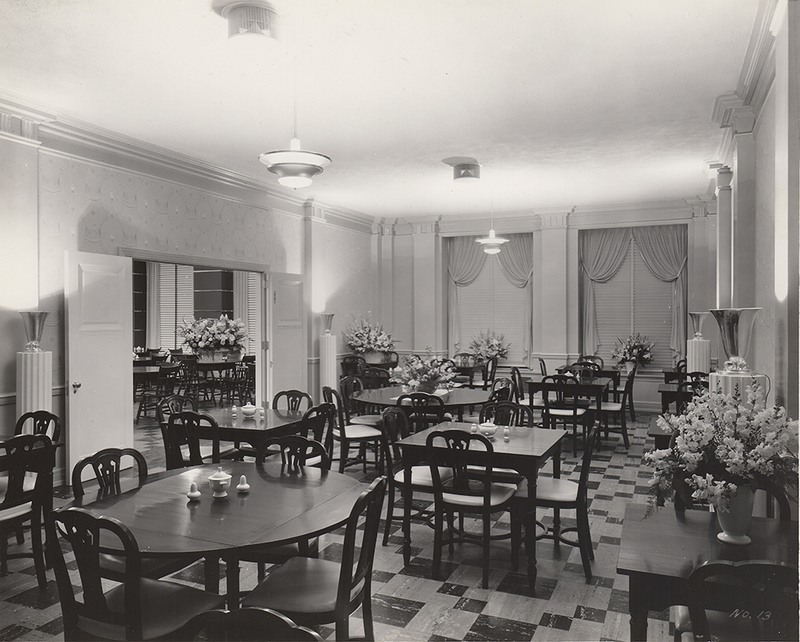 3 Front part of cafeteria taken from entrance to Empire Room. To the right of revolving door is entrance to coffee shop. Cobalt blue walls – furniture yellow drapes and table set ups – white blinds trimmed in the blue. Stairs mid-way left below mirror leading to lounge rooms. 4 Taken from revolving door – entrance to Empire Room in background. 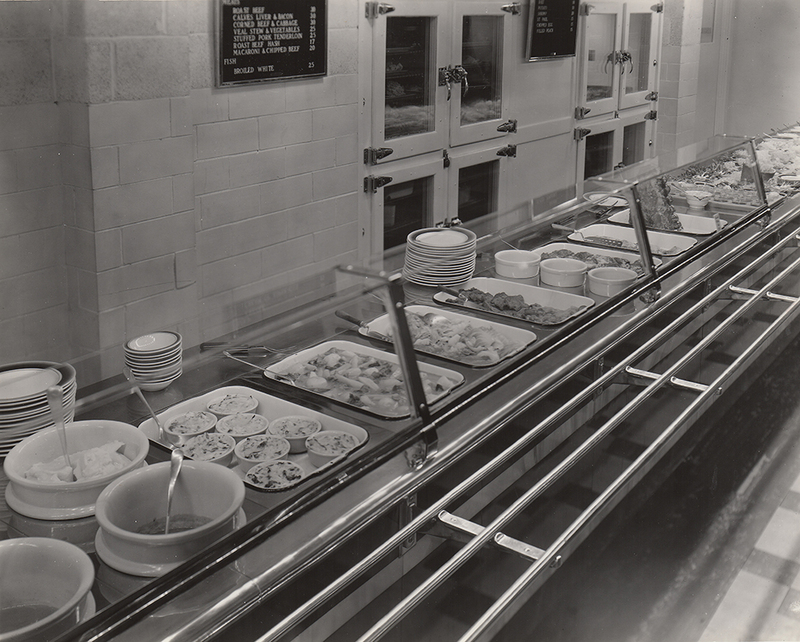 At end of wall to right, turn past check room to cafeteria’s counters. In the extreme background (X) is entrance to Anthony Wayne Room. Notice blocked porous ceiling which is sound proof. 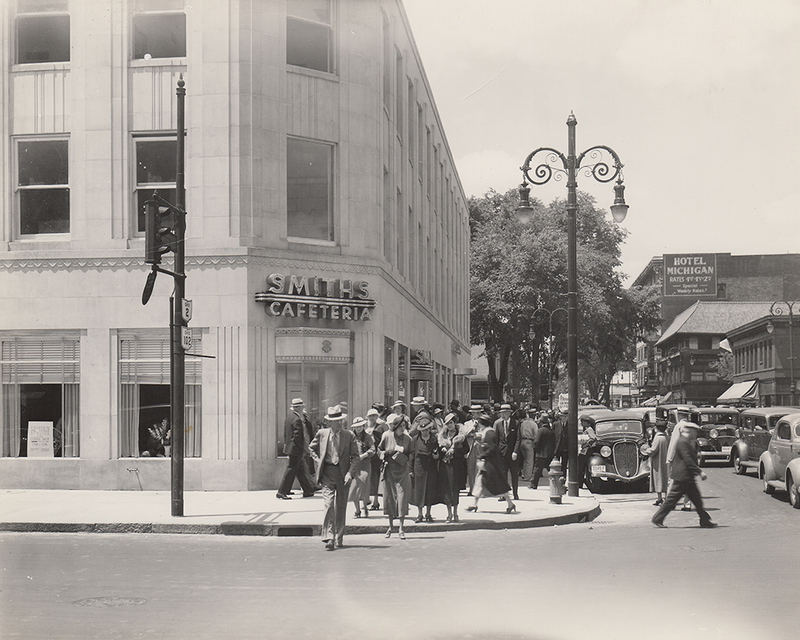 5 This is taken from windows on Erie St. showing cafeteria counters in background, also entrance to Empire Room. 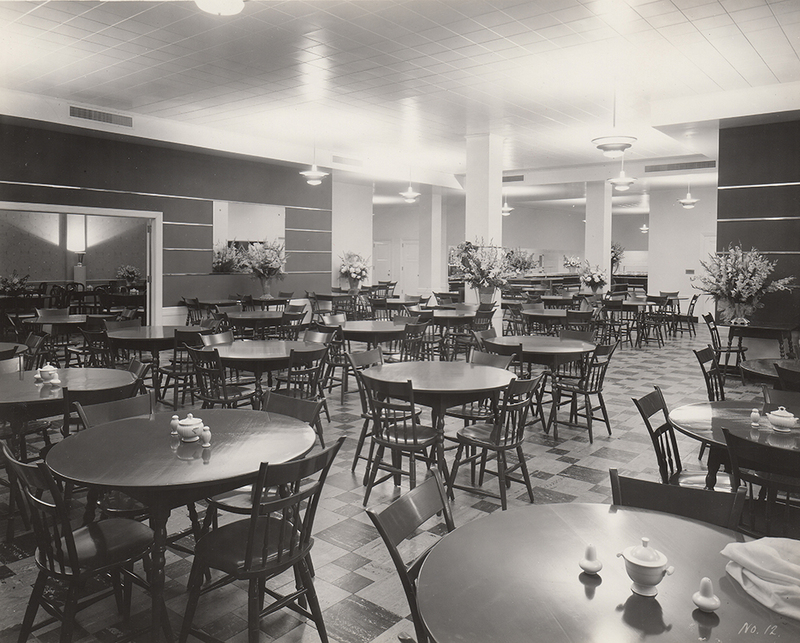 The cafeteria room is L shaped. Somehow these pictures don’t show the place as large as it really is. 6 Entrance to Coffee Shop can be seen better here – to left of door. 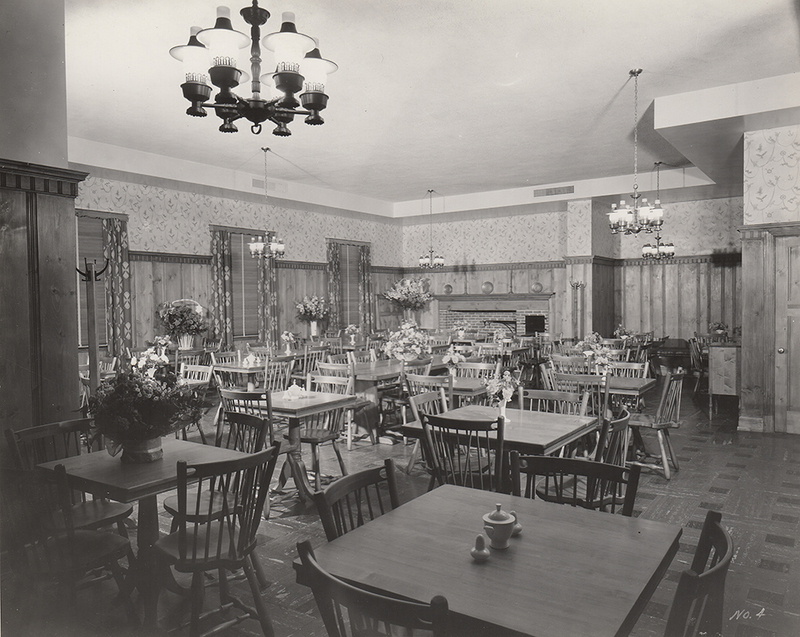 Notice clock above door – 12:30 – also no empty tables and it seats 550. 7 This room (Empire) should have had the linens on tables. It is a very beautiful room – yellow leather seats and drapes. Mahogany funiture – very formal when “dressed up”. 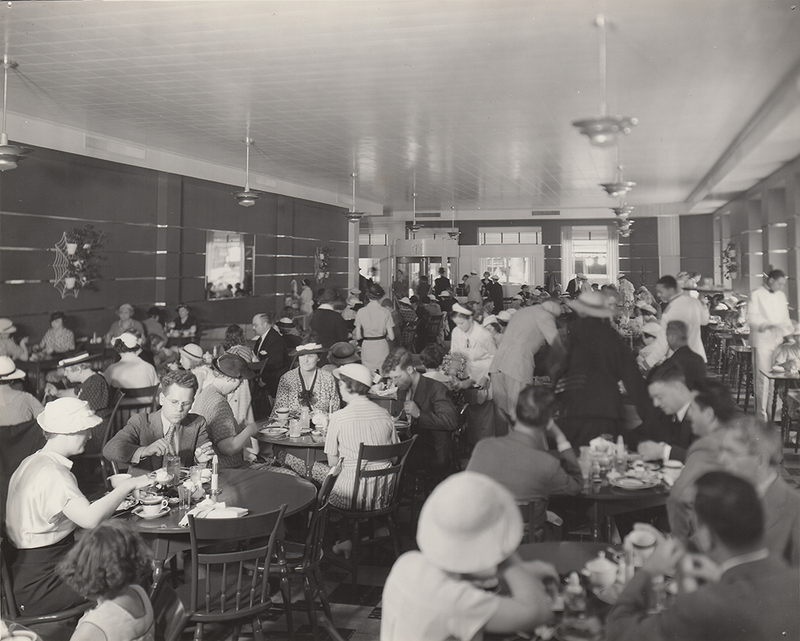 This is used for private parties – but is open at noon to cafeteria customers. 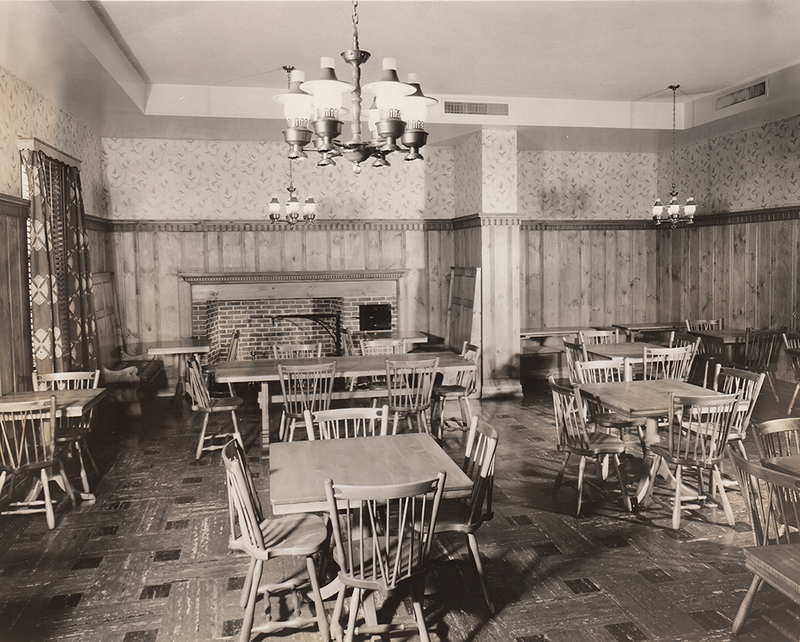 8 This is the Anthony Wayne Room. The men go for this in a big way. Natural pine walls – maple furniture, red drapes and design in paper. Also red in floor covering. 9 This is just a close up of fireplace. The benches are in red leather – also seat along wall to right of post. 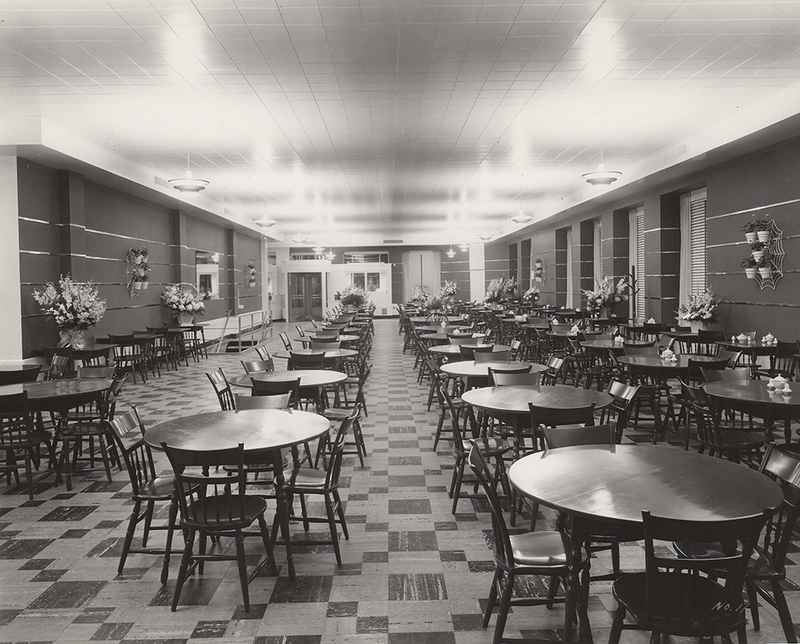 Notice lights – don’t know why the bric-a-brac was taken off of mantle when this was made (also table set-ups). You can see what I mean in #8 and #10. 10 Notice the bus “boy” on left. (Sam) He has 11 children now – one of them works with him. Notice the candle on the small table in fore-ground. These are to attract waitress or bus girl. 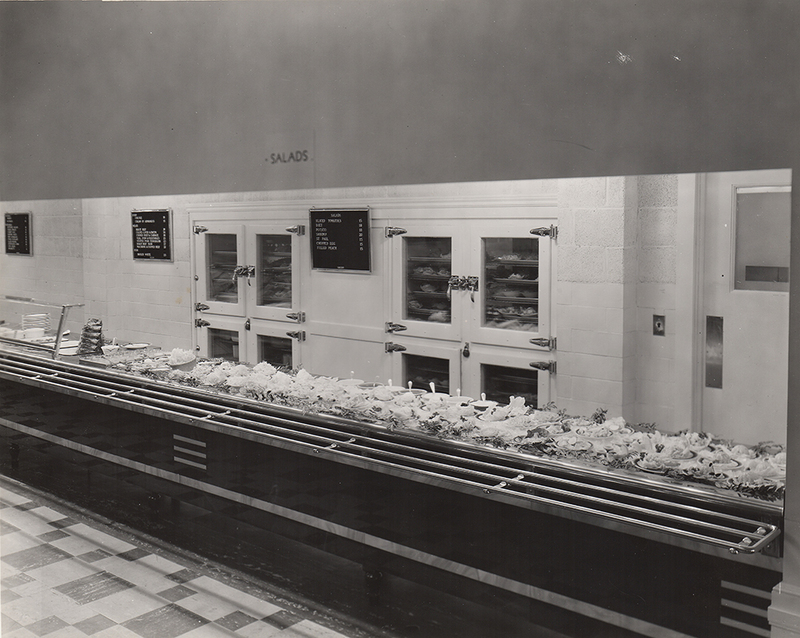 11 This is the beginning of line – salad counter. 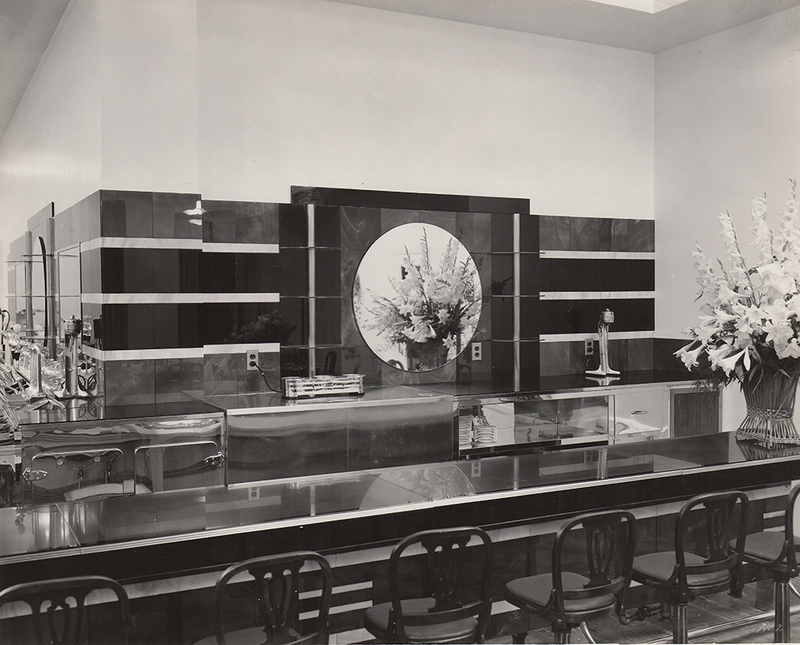 The darker wall where you see “salads” has the indirect lighting for counters. The lighter wall goes on up. The lower part of counter is the blue vitro-lite with inset of yellow. 12 This is continuation of salad counter. Meats – potatoes – soups and vegetables on back which this doesn’t show. There is a duplicate counter of this across back which you can see in #15. 13 From duplicate counter of meats, etc. comes this – desserts. How about a strawberry shortcake? Strawberries in large white bowl to left of center. The small opening under menu board goes into kitchen. 14 This is a continuation of dessert counter. Also bread – butter and drinks. There is another checker directly opposite this register which doesn’t show in any picture. 15 This gives you an idea of the “square”. This was taken at about where the other checker and water counter I spoke of in #14 is located. 16 This is part of counter in coffee shop which can be seen better in #17. It gives a good idea of back bar which is two shades of blue vitro-lite with the yellow trim. 17 This is counter and tables in coffee shop. The stools and chair seats are the blue leather and the furniture mahogany. 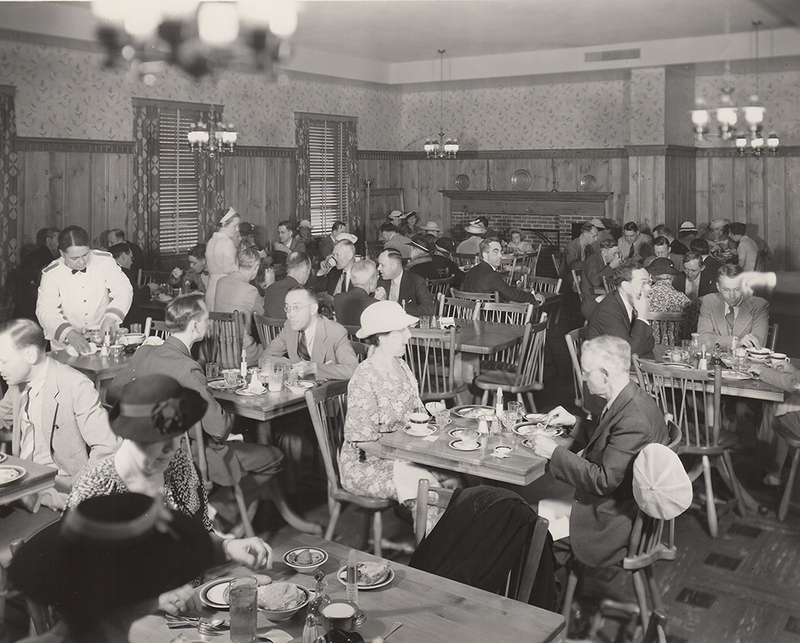 There are 5 full length windows across this room on Madison with the yellow drapes – one may be seen in mirror in background. The high back seats there (under mirror) are in blue leather too. 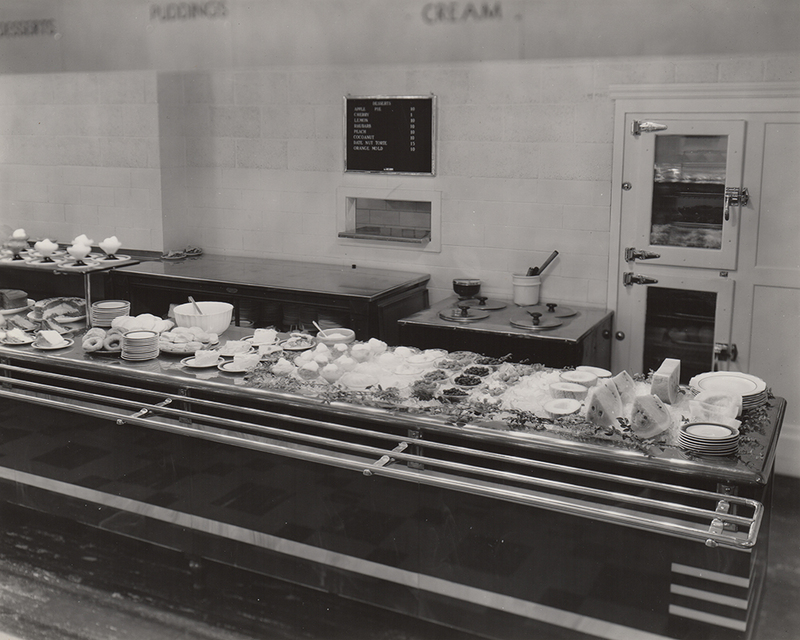 You can see the pastry counter on left too – which shows better in #18. 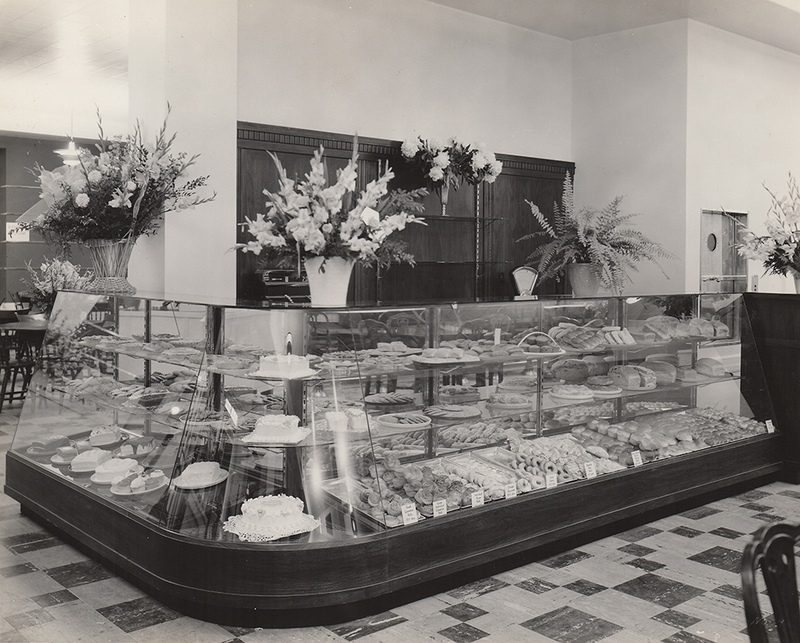 18 This is the pastry counter which will be moved into another room they have taken on Erie St. adjoining Empire Room. More tables are needed for the coffee shop. 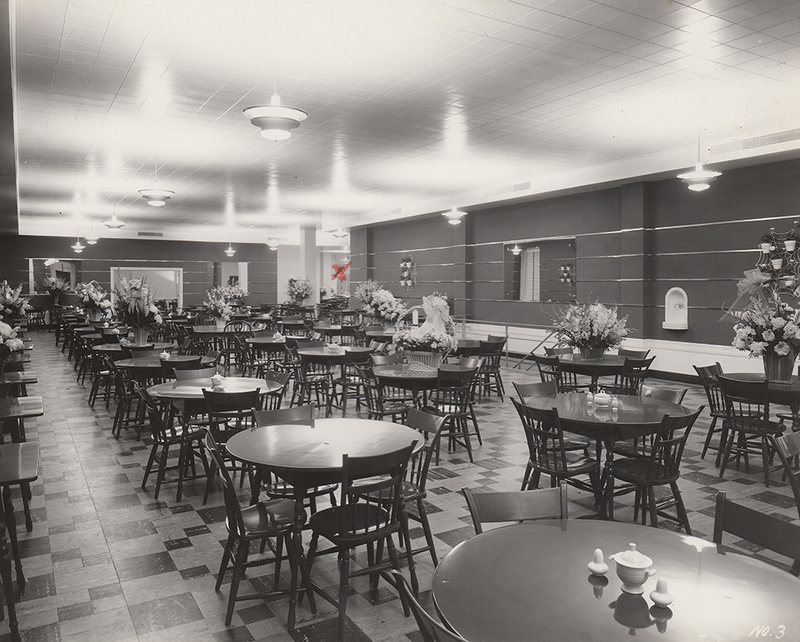 At the extreme left are a few cafeteria tables. 19 A typical noon day crowd. The crowds have been so big they haven’t been able to take care of them. The air-conditioning is a big attraction. July is usually a slow month you know. 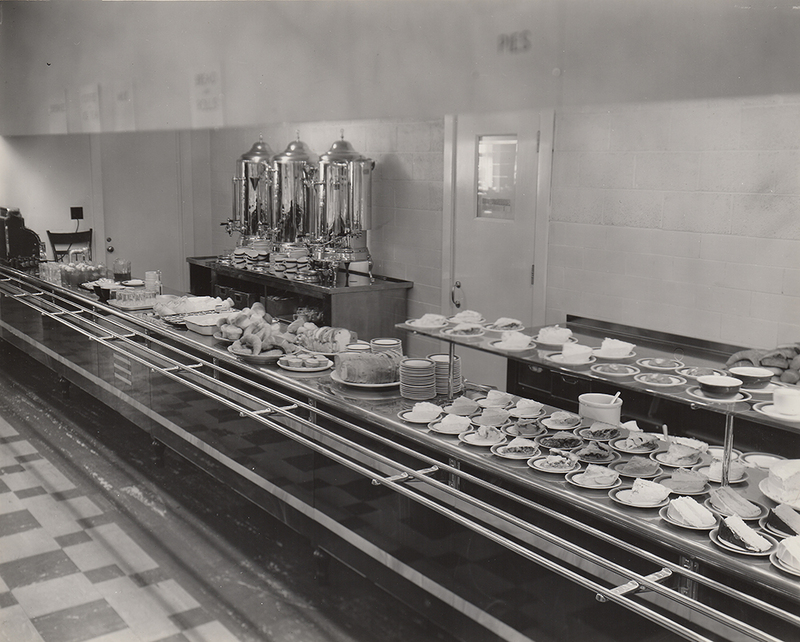 Seeing these photos brought back many fond memories as a child going to lunch at Smith’s Cafeteria with my father. My father worked for the “Manhattan Building Company” whose offices were just upstairs. 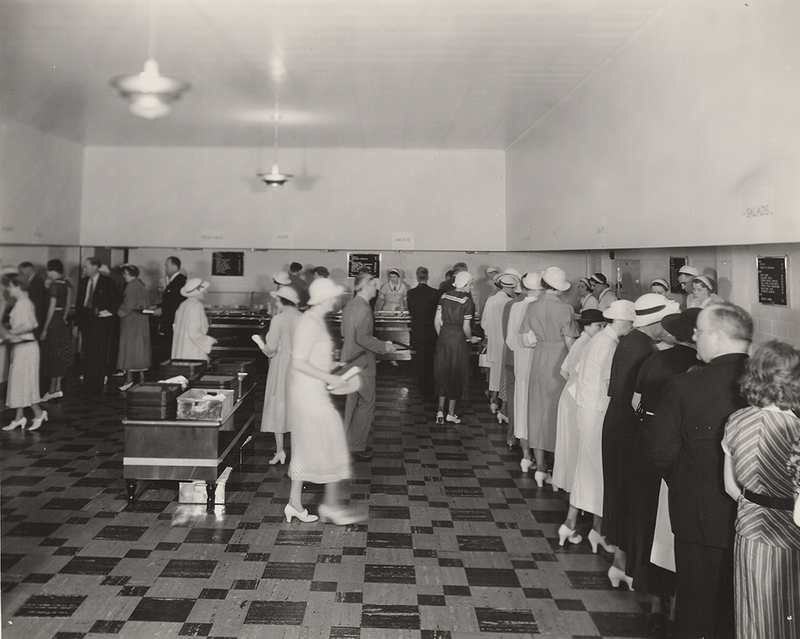 Making Grace’s cafeteria a most convenient dining choice. Thank you I remember it well!